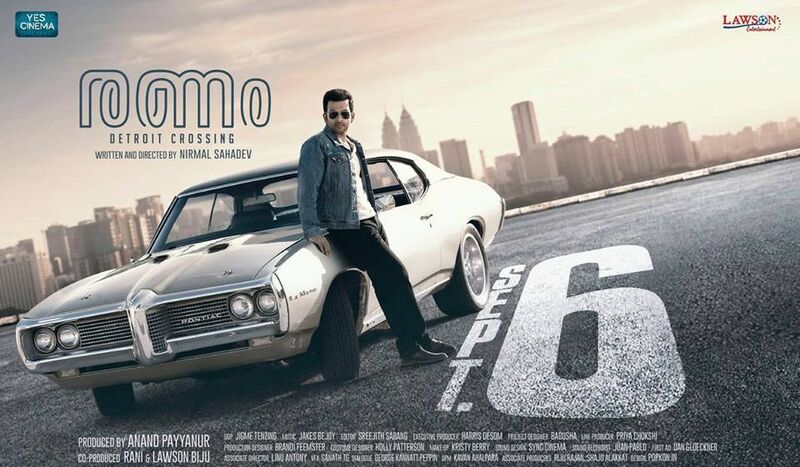 Ranam, Detroit Crossing movie release date announced , it’s schedule to hit theaters on 6th september 2018. Leading malayalam channel bagged it’s satellite rights for a decent amount, koode is another prithvi movie recently purchased by the channel. Detroit Crossing is a crime thriller movie written and directed by Nirmal Sahadev. Produced by Anand Payannur, Rani & Lawson Biju under the banner Yes Cinema Production and Lawson Entertainment. This is one of the awaited movie of Prithviraj, finally it’s release date is fixed. My story is another prithvi film released recently, which is not sold yet. 9 (Nine), Aadujeevitham , Kaaliyan etc are some of the upcoming films of Prithviraj. 9 movie produced by Prithviraj Productions in association with SPE Films India. Oozham, Ennu Ninte Moideen, 7th Day, London Bridge, Memories, Mumbai Police, Simhasanam etc are some of the other Prithvi films with Asianet. Rahman as Damodar Ratnam and popular artists are in the supporting star cast of renam movie. Isha Talwar, Nandhu, Mathew Arun, Celine Joseph, Ashwin Kumar etc are in the cast. Asianet announced a delicious feast for the 2018 onam holidays, they are bringing latest premiers and special programs during onam festival days. when we can expect the premier on Asianet ? Renam will be the Christmas 2018 film of Asianet, we can also expect Koode for Xmas 2018. Fans have huge expectation over this movie, His upcoming film 9 handling a science fiction horror subject. Prithviraj Sukumaran turned into direction through Lucifer movie. It’s started filming, Mohanlal playing lead role in Lucifer movie. Murali Gopy writing the script and It’s Produced by Antony Perumbavoor under the banner Aashirvad Cinemas. Stay tuned for more malayalam television news, satellite rights updates.